Gary West Meats is a brand of smoked meats that's been around since 1966, started by Gary West. West based his success on old family recipes taught to him by his grandfather, who ranched the valleys of southern Oregon. In 2004, West sought to retire and began looking for someone to buy his business. His daughter and son-in-law expressed interest in running the company, and bought it from him. Since then, Gary West Meats revamped its line of jerky and established a reputation of producing some of the finest meat snacks around. They even offer a line of jerky made from Certified Angus Beef. The company produces its famous jerky, smoked hams and turkeys, at its own facility in Jacksonville, OR. Folks can visit their factory, and sample the products at their "Tasting Room". The company sells products through its catalogs, its website, and in specialty stores. Gary West Meats claims to use only "grade A maturity beef" and choice cuts, citing the beef as being younger, more tender, and treated more humanely. They make all their jerky by hand from beginning to end, and they smoke them in real hickory chips, no liquid smoke. This "Traditional" variety is basically the company's original (or plain) variety. The first taste that I pick up when putting a piece into my mouth, is a slight sweetness, followed by a saltiness. The black pepper becomes noticeable next. The natural meat flavors come on quickly after taking some chews. This Traditional variety has the same natural meat flavor that I described in the company's Silver Fork Natural variety. The meat flavor has something of a sweet nature to it, smooth and mellow. I used the word, "buttery" to describe the Silver Fork Natural variety, and I find that same description here as well. There's a certain amount of refined quality in this meat taste that I find irresistible, and one that might even give a vegan second thoughts. The saltiness is much more defined in this Traditional variety than in the Silver Fork Natural. It's actually too salty for my preference, but the great meat taste makes me want to overlook it. The black pepper taste I mentioned earlier is detectable, but in slight amounts. I mostly taste it if I let a piece sit in my mouth for several seconds, but I don't taste it in the chew. The sweetness is only noticeable in the first few seconds after I put a piece into my mouth, it doesn't linger on at all. 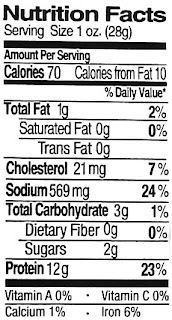 Overall, the tastes that dominate this jerky is the salt and natural meat flavors. This Traditional variety is perhaps very comparable to the Silver Fork Natural, except saltier, and of course, cured with sodium nitrite. 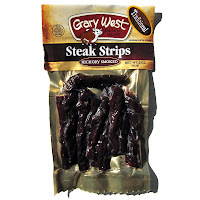 Gary West Meats actually refers to their products as "beef strips", instead of jerky, claiming that it's more moist than jerky. I don't know that I can buy into that, because I've had a lot of moist jerky in my time. With the way the market has embraced the "soft and tender" concept of jerky, I think this product fits right in to that genre. These strips are cut into 2-3 inch lengths, about the same thickness as a beef stick. For the most part, it's semi-moist, not just moist. If you bite off a piece, you'll see that it's more dry than it is moist. The photos below give you the sense that these pieces are very moist, but that's just the outside glaze. In researching the company, somewhere I read that Gary West Meats cuts these strips against the grain, making it easy to tear apart. I don't really see that here in this Traditional variety. I see a mixture of cuts both against the grain, with the grain, and angular. However, it's still easy to tear off and chew. Otherwise, I didn't find any chewy pieces of tendon or gristle, and no fat at all. 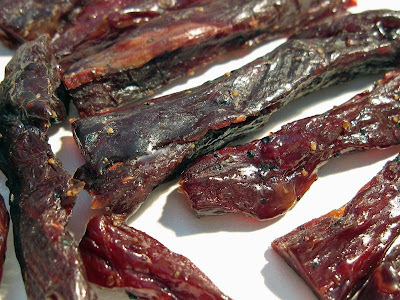 Overall, these pieces offer an excellent meat consistency for jerky snacking. Gary West Meats sells this Traditional variety at a price of $4.50 for a 2oz package. That works out to a price of $2.25 per oz, making this an expensive buy. You can get that price down to as low as $1.63 per oz, if you buy their larger sized packages. If you just want to enjoy some really great tasting beef flavor, I'd suggest that this is a good value. The smaller 2oz package, priced at $2.25 per oz, takes this out of the realm of general purpose snacking however, and into some level of "beef jerky appreciation". In that sense, price may not be a factor at all. But for general purpose jerky snacking, it's too expensive, unless you buy the 16oz package and get the price down to $1.63 per oz. But then again, you're still paying $26.00 for the whole package. If you're the type of meat snacker that puts emphasis on the natural meat flavors, then perhaps there is value here. 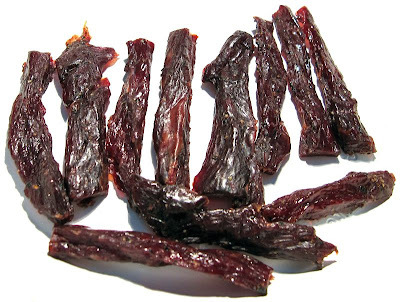 This Traditional beef jerky variety from Gary West Meats offers a wonderful meat flavor that I found so irresistible, and in a meat consistency free of everything but pure meat. In terms of flavorings, it's actually quite bland, and the for most part, relies on salt for its seasoning. And I find it too salty for my preference in fact. But the great meat taste that this offers makes me want to ignore the saltiness and keep reaching for more, in that sense it has an excellent snackability. This is a beef jerky that puts a lot of emphasis on the enjoyment of beef. I'm getting kinda jealous of the entire West family, they get to eat this stuff all the time. But it makes you wonder if they're so used to eating such great tasting beef, if they can even stomach a burger from a fast-food joint. A good beer to have this jerky is a lighter colored ale, like a pale ale, amber ale, or cream ale, which will help quench higher saltiness, but not compete against the natural meat flavors.